The building code and regulatory landscape can be difficult to navigate. Add to that the increased buzz around shipping container structures and some people will have concerns regarding how current regulations ensure that shipping container-based structures are safe. Currently, regulatory bodies are evaluating the best path forward and we at Falcon Structures, along with other players in the modular and shipping container industries, are working to move that conversation forward. The modified shipping container industry has a bright future as a cost-effective and environmentally-friendly alternative to site-built structures. Our goal is to help develop a thoughtful permitting process that allows the industry to thrive while comfortably satisfying everyone’s top priority: keeping people safe. The Modular Building Institute (MBI) and the National Portable Storage Association (NPSA) recently released a joint white paper as a first step in working with code officials to ensure the safe use of containerized structures. Below are six topics discussed in the paper that we believe should strongly inform the discussion on permitting containers. 1. Containers Already Go Through Rigorous Testing. Before a container begins its travels, it must meet International Organization for Standardization (ISO) standards. Public and private sector organizations use ISO standards to ensure the quality, safety and efficiency of products, services and systems. ISO standards for shipping containers make sure that containers can weather transport by ocean or rail without failure. The stresses of these journeys are extensive; containers can be loaded to hold 55,000 lb. and stacked nine loaded shipping containers high. Manufacturers confirm that a shipping container is safe for use through a series of ISO-specified tests on the container’s walls, frame, and corner castings. This testing provides reliable measures of container strength that can inform regulatory decisions. Consider the rigidity test. The manufacturer secures the container’s bottom corner castings and then applies 150 kN, or 33,721 lb., of force to the top edge of the container. To get a sense on a smaller scale, imagine pushing the upper edge of a cardboard box that is glued to a table top. The measure of how much force can be applied to the top edge before the container begins to collapse or warp can be translated into an equivalent wind load. According to the standards of the rigidity test, a shipping container can withstand wind speeds of 180 mph without wavering. The rigidity test is just one of many verifying that shipping containers are strong enough to be used as safe building components. The referenced white paper also presents evidence that shipping containers exceed the requirements of seismic design and snow loading. 2. Different Container Modifications Come with Different Implications. Cutting out an entire side wall from a container will have different structural implications than simply adding a steel framed door. Engineers, regulatory bodies, and leaders in the modified shipping container industry should work together to develop guidelines on which modifications can be quickly permitted and which call for additional review. 3. The Public Use and Permanence of Container Structures Vary. If the general public will have access to a shipping container structure, it should be inspected and held to a high standard to ensure safety. However, private businesses regularly use containers as temporary pop-up retail stands or as mobile offices. Cumbersome permitting could make deploying portable structures especially troublesome if a business must repeat the process every time they move the container. Thoroughly inspecting the manufacturing processes of a standardized container product, like a single unit ground level office, could provide a speedy alternative over inspecting every unit on-site. 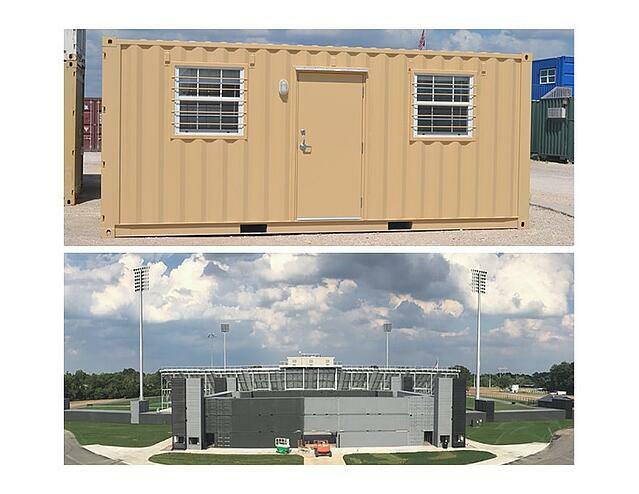 A precedent already exists for streamlined permitting on temporary structures as laid out in sections 108.1 and 108.2 of the International Building Code (IBC), which is used as a base code standard by most jurisdictions in the U.S.
A single-unit, privately-used office container office (top) could have a more streamlined permitting process than the publicly-used Fortress Obetz (bottom). 4. Some Typical Regulations Just don’t Make Sense for Shipping Containers. A great example of a regulation that wouldn’t apply to a container is roof slope. Building slope into the roofs of traditional buildings prevents rain water from pooling, warping the roof, and then causing structural damage. Yet, a container’s steel sides will not absorb water or warp under the weight of a roof-top puddle. Mandating that container structures have sloped roofs will not better protect the structures or their occupants. 5. Pesticides in Marine Wood are Only a Hazard to Bugs. It is true that original container flooring contains basileum, talileum 400, and radaleum. However, health and regulatory organizations agree that these substances only pose serious health risk for insects. Talileum 400 can be toxic to mammals, but only if ingested in large concentrated amounts – an unlikely scenario considering only a small amount is infused inside of the wood. In addition, talileum’s vapor pressure is low, meaning that it will not readily diffuse into the air. Radaleum also has a low vapor pressure and is “relatively non-toxic” to mammals. Because the amount of pesticides in shipping container flooring is small and infused inside of the wood, there is practically no risk to mammals. If exposure to pesticides remains a concern, the floors can always be sealed. 6. Reusing Containers is Key to Existing Businesses. Current regulatory guidance is unclear on the fate of reused containers even though there are tens of thousands of repurposed containers already in use around the country. Excluding used containers from permitting would create confusion and potential losses for customers who have already integrated shipping containers into their business functions. Additionally, if regulators only approve brand new containers for modification, the end product will cost businesses more and be significantly less friendly to the environment. Falcon Structures hopes that these considerations will foster a productive dialogue. We are open to hearing from other voices on the issue as we move through the long and winding path to clear and concise regulations. True to Falcon values, our commitment to safe and sensible solutions remains steady. Want to learn more about the mobile office containers already out in the world? Check out our blog post. 877-704-0177 or send us an email at sales@falconstructures.com.